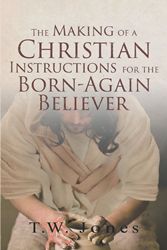 “The Making of a Christian: Instructions for the Born-Again Believer” from Christian Faith Publishing author T. W. Jones is an inspiring handbook for new believers seeking to follow in Christ’s footsteps in all the ways that matter. “The Making of a Christian: Instructions for the Born-Again Believer”: a manifesto for the faithful, is the creation of published author T. W. Jones, a born-again believer with a heart for people. Published by Christian Faith Publishing, T. W. Jones’s new book is a straightforward approach to the faith that focuses on the essentials of the journey to spiritual maturity. With honest conviction and contagious zeal, Jones will refresh the spirits of new and even seasoned believers and strengthen their commitment to Christ. View a synopsis of “The Making of a Christian: Instructions for the Born-Again Believer” on YouTube. Consumers can purchase “The Making of a Christian: Instructions for the Born-Again Believer” at traditional brick & mortar bookstores, or online at Amazon.com, Apple iTunes store, or Barnes and Noble. For additional information or inquiries about “The Making of a Christian: Instructions for the Born-Again Believer”, contact the Christian Faith Publishing media department at 866-554-0919.